SpectraFluidics, the innovator in high performance trace chemical vapor detection and analysis systems, has demonstrated the repeatable performance capabilities of their novel sensor platform when used to detect DNT, an important chemical marker associated with TNT explosives. 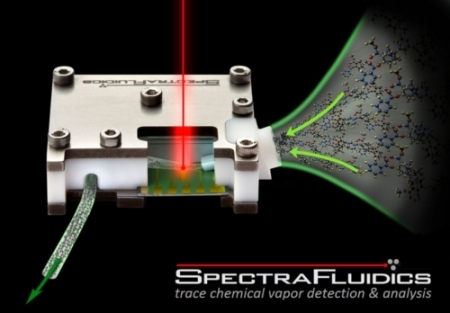 "This breakthrough capability for detecting vapors from explosives opens up tremendous commercial applications for the unattended and automated detection of trace levels of suspect chemicals, which can range from airport screening and port security to anti-bioterrorism and food supply safety," Philip Strong, CEO of SpectraFluidics commented. Tests documented in the paper show the extraordinary sensitivity of this new generation of sensors that enable a user to identify the chemical signature of a substance within two minutes. Dr. Piorek stated that it's this combination of sensitivity, chemical specificity, and speed that makes the technology so appealing to many homeland security, food and research applications. "The researchers at SpectraFluidics and the UCSB Institute for Collaborative Biotechnologies have developed a fundamentally new approach for detecting chemicals at extremely low vapor phase concentrations," Dr. Piorek commented. "Employing an innovative combination of microfluidics and nanotechnology in our patented nanoscale vapor detection platform has enabled us to create a microsystem on a silicon chip that biomimics a dog's keen sense of smell." Many existing chemical detection systems also use surface-enhanced Raman spectroscopy (SERS), a process that distributes or "scatters" photons of the material being tested to isolate individual molecules for identification purposes. In contrast, SpectraFluidics' patented technology combines SERS with free-surface microfluidics, a process that draws liquid along a microscale channel which provides the effect of both concentrating molecules and greatly enhancing the Raman signal. "Since the first proof of concept was completed several years ago, SpectraFluidics has been awarded key development contracts with multiple government agencies and is placing field trial products with leading manufacturers of security and analytical equipment," Strong added.